Happy Wednesday! Today I wanted to share with you a round-up of some of my favorite coats for fall. There are a number of trends in outerwear this season – and luckily for all of us working women – a number of on-trend fall coat styles are perfect to wear to work. 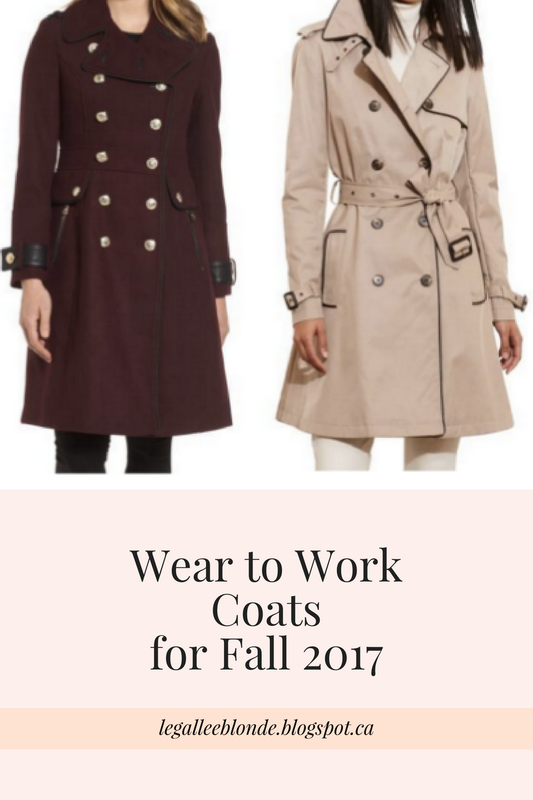 Below are my favorite work appropriate fall coats/jackets. Let me know which coat (or trend) you are liking the best, and which you intend to wear to the office this fall! My personal favorite coat is the very first one shown below – the red long military inspired coat from Banana Republic. You may have seen me trying it on at the Banana Republic NYFW Presentation. I have been swooning over it ever since I tried it on, and think I need to pull the trigger and buy it this weekend, when I actually get some down time to shop! Speaking of the weekend – it may only be Wednesday but I am already looking forward to the weekend. It has been a very busy few weeks with work, and this weekend I intend to take some time off to spend time with the people I love, do some shopping, and drink so. much. coffee. in. bed. Just two and half more days to go until some weekend relaxing! "8 Best Over the Knee & Knee High Boots for Fall"
"Military Blazer & Sweetheart Dress"